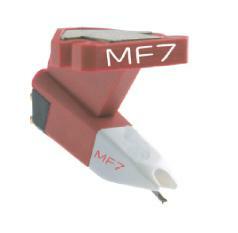 Ortofon MF7 Single Cartridge DJParts - All Variety of Parts that DJ Needs. Ortofon is proud to announce the arrival of the new MF-7 cartridges value-priced ‘single’ DJ cartridge that can be used for a wide variety of applications. The Ortofon MF-7 prides itself in having a rugged suspension created for scratching & backcueing, and rough handling. The MF-7 is particularly good for electronic music and hip hop, where there is an emphasis on energetic percussion and deep, aggressive bass. Without harshness, the lively-sounding MF-7 has a slightly accented midrange, to help scratching cut through the mix.